Firefox lets you import bookmarks from Internet Explorer ("Favorites") in one of two ways. You can import them from a previously exported HTML file, or you can import directly from Internet Explorer: that scenario only works if the version of IE you want is installed on the same PC, and loaded under the same Windows user account (individual settings are saved under one's own profile). Just like we did in the "Import Chrome bookmarks into Firefox" tutorial. First scenario: you already exported IE favorites to an HTML file. (Reminder: do that using the Favorite button's dropdown - see first screenshot.) Look at Step 4 to contrast the difference with the second approach. 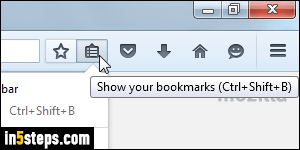 Once you are in Firefox, click on the Bookmark button, and select "Show All Bookmarks" at the bottom, or hit the equivalent keyboard shortcut of Ctrl+Shift+B. 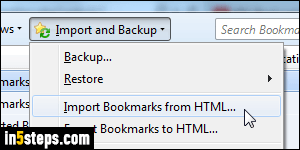 In the Firefox bookmark manager, click on the Import and Backup menu and choose "Import Bookmarks from HTML". Navigate to the folder where you saved your favorites, and double-click on the file to select it and load it. You are done: within under a second, typically, all your favorites will now appear under the Bookmark Menu on the left! You can close the bookmark manager. 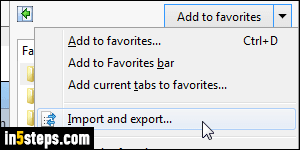 Without having to export them first, you can add your IE favorites to Firefox using the built-in import tool: another advantage of this approach is that all your favorites will be added in a special folder, and not mixed with your existing Firefox bookmarks. Still in Firefox's bookmark manager, click on the Import and Backup menu, but this time pick Import Data from Another Browser. Firefox will auto-detect all web browsers installed on your PC. Select Internet Explorer and click Next. On the next screen, keep Favorites checked and click Next. The Import Wizard will show a "The following items were successfully imported: favorites" confirmation at the end. 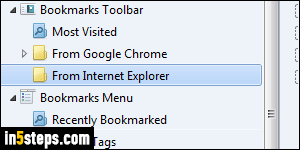 Your IE favorites are stored in a "From Internet Explorer" folder under the Bookmarks Toolbar (links from Favorites Bar), and under the Bookmarks Menu (Favorites menu shortcuts)! Bonus Tip: Internet Explorer includes the same functionality, which means that you can also import your Firefox bookmarks as IE Favorites! Your bookmarks and favorites will quickly get out of sync, if you regularly bookmark new sites, but these steps make it easy to keep both browsers relatively the same.